The Portuguese broadcaster RTP has been celebrating its 60th anniversary and Portugal is very proud of having such a long history of national television services. Last year Portugal did not take part in the Eurovision Song Contest due to financial reasons. Therefore the national final “Festival da Canção” has been resurrected this year. The festival even did have two Semi Finals and one Grand Final. In the Grand Final there were seven finalists in a kind of weak competition. 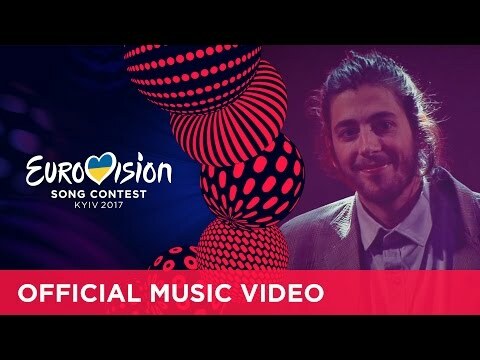 But there was one singer with the most dedicated song, who won the hearts of the audience by a storm and that was Salvador Sobral with his song “Amar Pelos Dois” (For The Both Of Us). Salvador sang his song with such an indulgence and passion that received the majority of the jury and televotes. The interval act was a great medley of former Portuguese songs which is worth to watch. When Salvador won the contest, he performed the winning song again together with his sister Luisa, who wrote the song for him in a very touching way. Salvador Vilar Braamcamp Sobral was born in Lisbon in 1989. He first began to study psychology but later changed it to jazz music. Salvador also went to the USA to study at the prestigious Taller de Musics school. His passion for Latin music, including bossa nova he can express in his unique appearance on stage. It is said that he has a certain magnetism on stage and people tend to appreciate him immediately. The appearance at the “Festival da Canção” is another step in his career which can bring him quite far. The song “Amar Pelos Dois” is a beautiful, almost dreamy tune with a lot of emotions. This is the only song in this year’s ESC of this genre, which could be seen as a dark horse. Judging be the enthusiastic applause within the song presentation proofs that this entry is something special. With this contribution Portugal could really have one of the biggest chances to win Eurovision in years. The charm of the singer, combined with this beautiful melody will definitely shape up well. Well chosen, Portugal! Portugal has joined the Eurovision Song Contest in 1964 with the debut song “Oração” by António Calvário and came last with zero points unfortunately. This should not been taken as a bad omen, but Portugal is a country which has never won the ESC. Portugal has made it 40 times in the Grand Final, out of 49 participations, and reached the Top10 only 9 times. So there is a 19% chance to reach the Top10 for Portugal. It’s a pity that Portugal never made on the first places, there were many great and outstanding songs in the past. Especially in the 80’s there were many strong songs. But the juries were never generous with Portuguese entries and Portugal has always been so eager to shape up well. The songs from Portugal have often been very folkloristic and became more modern in the recent years. Sometimes the Portuguese even send traditional Fado to the ESC, which is a great cultural enrichment, but often brought not enough points. But a lot of emotion and drama can mostly be found in the Portuguese entries even in the more contemporary songs. The enthusiasm for the ESC in Portugal changes from year to year. The Portuguese are used to the fact that whatever they send will probably not be successful. Since the Semi Finals have been introduced in 2004, Portugal only made it three times into the Grand Final. 2017-05-14 - Sensation – Portugal wins Eurovision!